I have struggled as many others have to cope with the recent election. My art work is often a respite from such troubles. 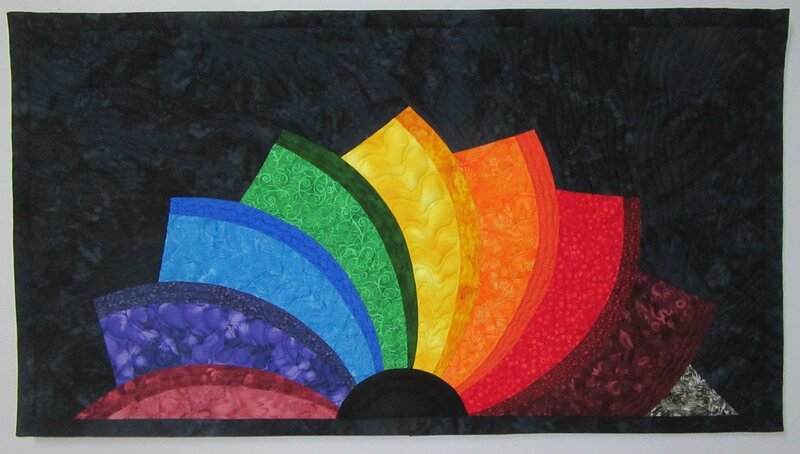 At a recent festival a customer bought one of my rainbow flower/sun wall quilts. She commented that her daughter would love it due to it’s embodiment of the Diversity colors. I had only been thinking rainbow colors but she made me think about making my next multi color quilt with diversity in mind. This January I made the quilt shown in this blog and I’ve simply called it “Embracing Diversity”. May we all reach out to everyone in our communities, even those who think differently or vote differently. May we try to find shared issues and ways to work together. A friend’s bumper sticker says it best: “Think Globally, Act Locally”. Hi!! I have a blog link up party – Off the Wall Fridays – specifically for textile and art quilting. I thought you’re blog would be a good fit and wanted to invite you! Please feel free to link up any week you post! Its open every Friday through Monday.